Occupational therapy focuses on the organization of sensory information for use in the classroom, on the playground, in activities of daily living, and relationships and interactions with others. "Sensory" pertains to our senses – hearing, sight, smell, touch, taste, and perception of motion, movement, and gravity – while "integration" is the process of unifying or allowing the brain to use the information that the senses take in. At Beth Ingram Therapy Services, handwriting problems are the leading reason why school-age children are referred for occupational therapy, although we see patients for a broad range of disorders. Our goal is to identify any difficulties your child might have with his or her sensory-motor development and provide comprehensive OT to help your child overcome these obstacles. Your child may need to be screened if you have concerns regarding any of the above, if your child is not meeting age-based sensory-motor milestones, or if he or she displays possible signs of sensory integration dysfunction. Please ask your school's director to contact us to set up a screening at your school. An evaluation is a comprehensive assessment using standardized testing measures, informal assessments, observations, and parent/caregiver reports to address your child's needs. 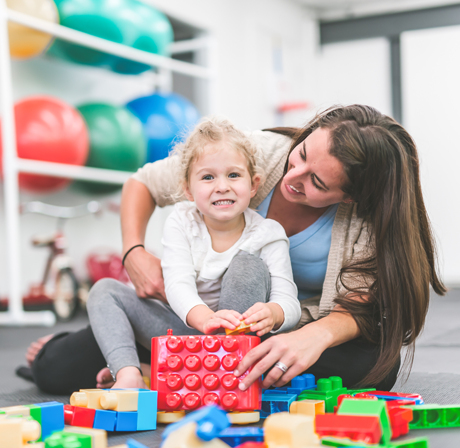 During the evaluation, your child will participate in a one-on-one assessment with an occupational therapist for an in-depth look at his or her fine motor skills, visual perceptual skills, self-help skills, sensory processing, and modulation. Formal testing measures will be used to determine your child's current level of functioning in these areas. Evaluations can be conducted in any one of our four clinic locations. Bilingual evaluations in Spanish and English are available upon request. Call our office to schedule an appointment. We take many insurances and offer private-pay options. You may need a referral from your primary care physician/pediatrician for us to be able to complete your child’s evaluation. It takes approximately one hour to complete the OT evaluation. The therapist will conduct a comprehensive assessment to determine your child's current level of functioning. At the end of the evaluation, your child’s therapist will review the results with you and discuss treatment recommendations. Our pediatric occupational therapist will write up the evaluation and submit it to your insurance company for authorization, as well as mail or email a copy of it to you directly. Once we obtain authorization from your insurance plan, our office staff will contact you to schedule your child’s first appointment. At Beth Ingram Therapy Services, our pediatric occupational therapy (OT) services are provided by master’s level and licensed pediatric occupational therapists with specialized training in OT for children. They use the latest cutting-edge therapy techniques and keep abreast of current treatment techniques through a variety of continuing education courses. Pediatric occupational therapy sessions are designed around an individualized plan of care to address your child's specific needs and provide them with the greatest quality of life. Treatment plans include detailed home exercise programs to incorporate therapy techniques into the home and community settings. The number and frequency of sessions is based on the recommendations of the occupational therapist who conducted your child's evaluation. Therapy can be conducted in any one of our four Tampa Bay area clinics. We also offer a handwriting class to improve prewriting strokes and handwriting skills for children in preschool and elementary school. In an 8-week class, with groups of two to four children, our pediatric occupational therapists help guide the children to properly form upper and lowercase letters of the alphabet as well as numbers. The handwriting class is offered in our Brandon and South Tampa offices. To learn more, call (813) 653-1149. If you are a parent, doctor, or educator with a child who needs pediatric occupational therapy services, turn to the professionals at Beth Ingram Therapy Services in the greater Tampa Bay area. Call (813) 653-1149 or request an appointment online.